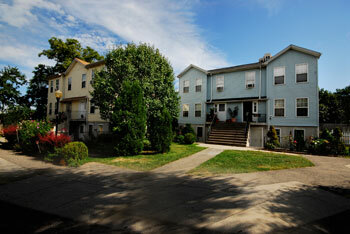 Town Homes designed to accommodate two families bring together the young families and elderly citizens of the community. NDR Group, using numerous partnerships and grant sources invested $2 million into the 20 unit two-family home project near downtown New Rochelle. The town houses will consist of 1900 square foot units sold to first time home buyers and one bedroom senior citizen apartments rented to persons ages 62 and over. NDR Group’s strategy in revitalizing the city center neighborhood is to focus on creating a sustainable residential community that will continue to support itself for years to come. NDR Group is dedicated to the maintenance and ongoing renovation in light of gradual deterioration. The Lawn Avenue Town Homes are a prime example of gauging the specific needs of the community and working with its leaders to bring about changes. 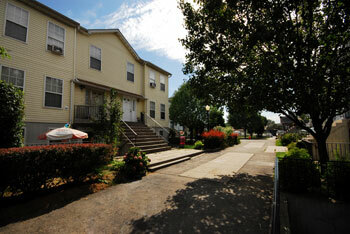 The unique concept of the Lawn Avenue Town Homes serves the needs of two key population groups – young families and senior citizens. The families each had the opportunity to purchase a home that was subsidized to cost less than 50 percent of annual salary, which low income households have historically been forced to devote to housing. To help with mortgage costs, the families were paired with senior citizens who rented the one bedroom portion of the town home. The coupling of young families with the elderly is both financially beneficial and positive in creating an inter-generational connection between members of the community. The Lawn Avenue Two Family Town Homes help increase the availability of affordable housing while creating unity between the young and old as they are placed in a symbiotic relationship giving the other both financial support and encouragement.